Puka is located in a rural setting, conveniently located for those people wishing to travel to both Palmerston North and Wellington. Puka has been tastefully decorated, sourcing decor, from Spain, Mediterranean, Italy and Bali to create a unique atmosphere. Egyptian cotton sheets on a queen size bed and a deep claw foot bath allow for maximum comfort and relaxation. The accommodation allows you to have a wine on the deck in privacy watching the sun go down. This might be at the end of a hard day tramping in the Tararuas or fishing off Waitarere beach or mountain biking on near by trails. Kitchen facilities (microwave, electric frypan, induction element, grill oven with all cooking equipment required) is available for those who wish to self cater or a range of restaurants are also available with 2 minutes drive. Puka is set in beautiful gardens and your hosts Anne and David will ensure that you have the best experience possible, providing home grown organic honey, berries (when in season). 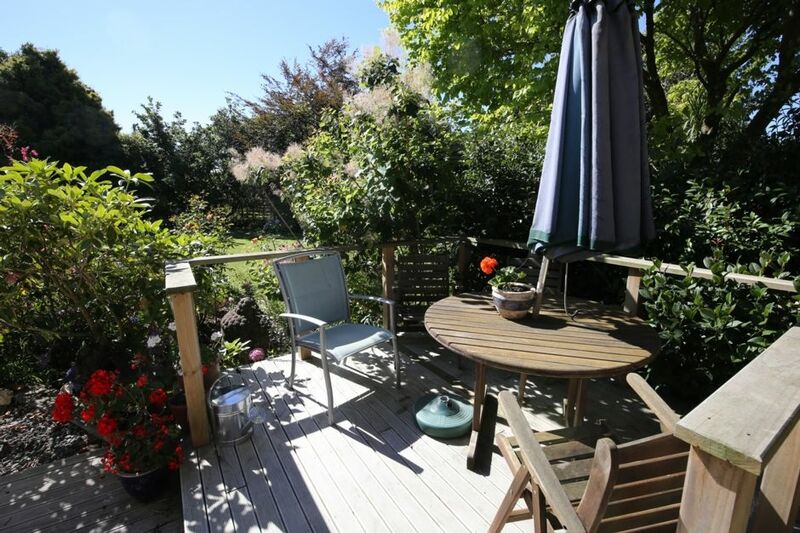 Unlike some accommodation in Levin, the quiet rural garden setting ensures a private, relaxing stay at the same price as you would pay in a motel. For those people who are artistically inclined, there is an upstairs art studio available to indulge your artistic streak (at no extra cost, but booking in advance please). While Puka is ideally suited to a couple; we are able to provide a single mattress at no extra cost for a third person. Two mountain bikes available free to use. So come and enjoy a comfortable, relaxing stay in a rural environment that will allow guests to experience a slice of real New Zealand life. Our stay was short and sweet and we didn't really spend time at the property due to other commitments. The cottage was nicely decorated but had a very damp musty smell. Puka is a gorgeous wee gem with a divinely comfortable bed. I wish I'd been less busy so I could have enjoyed the house and garden more - maybe had a fire outside or another bath. If I'm ever in Levin again I know where I'll be staying. Even though looks nice in photos, the photos do not do this place justice. It is absolutely gorgeous. You walk past owner's place to get to it, but once there you are in your own little secluded world - surrounded by tall trees, birds singing - with comfortable & ample outdoor seating to enjoy it. We were there on a hot day, and inside was a cool haven - completely private once again, very comfortable bed, stunner of a bathroom with large shower & claw foot bath - the whole place beautifully furnished - and feeling like someone's home, not a soul-less motel / hotel suite. Just one criticism - the Pool should be removed from list of features, as at end December (well into summer) it was empty. Thank you soooooo much for the fantastic review. We have just got back from perth and It was a lovely present to read your comments. We are humbled and really pleased you enjoyed your stay. Really nice one bedroom unit with everything you need. Bed was super comfy. Hosts were easy to contact etc. I would stay here again. The property was lovely and very clean. The pictures on the website are true to the actual place. A very peaceful, private setting with a comfortable bed and large bath area with a nice modern shower. The kitchenette is well set up if you would like to make your own meals there. Very easy access to downtown Levin while still having the country feel. I would definitely book this property again. In an Idyllic rural situation, Puka is a leisurely one and half hour drive from Wellington Ferry and a maximum 2 hours to the airport. A number of guests have commented on the quiet peaceful atmosphere at Puka Cottage Inside it is modern and tastefully decorated. The bedroom is elegant and fresh and looks out into the bush. It has a queen bed dressed with quality linen. The bathroom is modern yet features a clawfoot bath and a shower. Puka's lounge features a kitchenette, with microwave, induction element, and small grill oven. Fridge, full kitchen equipment supplied and dining table. Lounge area features TV, couch. Full wifi available. Decks for the summer months. These living areas are decorated with a fresh balinese flavour and colourful relaxing art pieces.